I enjoyed writing many posts last year, but here’s four of my reader’s favorites. Hope you’ll enjoy. Winter Garden Décor www.gardenchick.com/winter-garden-decor Tea Cup Winter Wonderland http://gardenchick.com/teacup-winter-wonderland/ Must Haves for a Flea Market Garden http://gardenchick.com/flea-market-gardens/ Don’t Throw That Away, I Can Use It in the Garden! 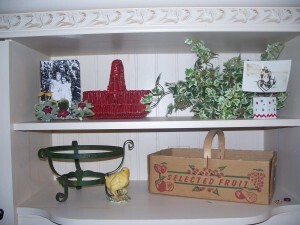 http://gardenchick.com/Don’t-throw-that-away-I-can-use-it-in-the-garden! Enter your email address below to subscribe to my site and get new content delivered directly to your inbox. Gardenchick is a place for gardeners, flea market fanatics, lovers of the farmhouse look, and purveyors of all things rusty! I’m not sure when my fascination with junk began, but gardening was in my blood from an early age. I remember my grandmother could throw a few seeds out and have the prettiest flowers. Sweet peas were rampant beside the front porch. I can see her now, bent over pulling weeds, and I find myself doing the same thing anytime I’m in the yard. My dad was raised on a large farm, and even though he moved away, and we always lived in the city, he had a garden. He had me help him plant a garden in May before he died in August. So you can see, gardening just comes naturally to me. I can’t explain the love of rusty and all things chippy, but I have dug through more barns and sheds than I would like to admit to bring out a rusty wagon or old chicken feeder. So, I hope you will follow along, and we can learn a few things together. I’ll be sharing gardening ideas, my flea market finds, and thrifty ways to repurpose. Garden Chick, copyright 2003 - current date. All Rights Reserved.